I’ve learned to love shade. From November to March my garden is completely overshadowed by the London townhouse I live in. Shafts of sunlight appear in spring, filtered by buildings and trees. I have a corridor in which to plant a few sun loving specimens and another, larger patch, which is in what gardeners call ‘full shade’. I moved in ten years ago and it’s taken me this long to get to grips with my small shady garden. Here are the lessons I’ve learned. The picture above, taken from the bedroom window, shows the garden mid afternoon in late May. You can see how little of it gets sun at this stage of the year. As the summer progresses the sun gets higher in the sky and the sunlight creeps further into the garden. By mapping the sun you can plan where you and your plants can best enjoy it. If you like a glass of wine in the late afternoon sun you need to position your garden furniture accordingly. The same goes for plants. The mantra ‘the right plant for the right place’ is never more appropriate than in a small shady garden. The Acer, for instance, glimpsed just above the tree fern, bottom right, needs dappled shade. It sits on the line between shade and sun. Luckily it’s in a pot so I was able to move it several times before I found it’s happy spot. This is the view of the garden from my kitchen through sliding glass doors. It is December but it is still lush and green. The white Camellia is in full bloom and behind it a hardy fan palm (Trachycarpus fortunei) ensures we are not overlooked. 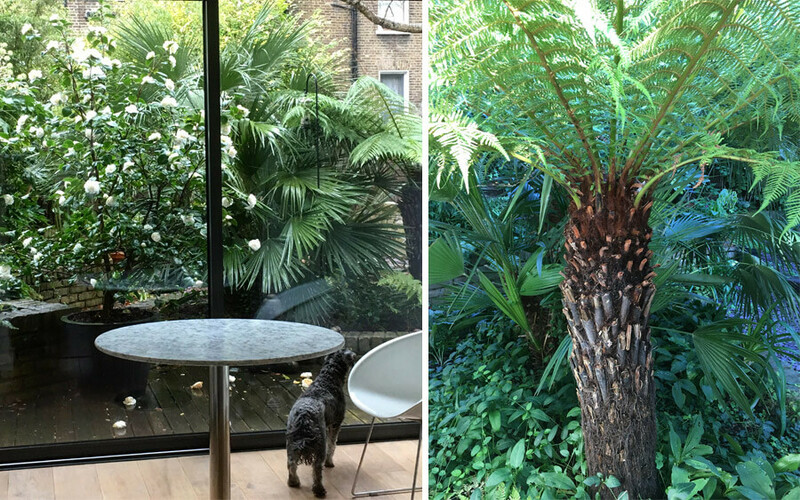 To the right is my beautiful tree fern and further back on the left is a Fatsia japonica (shown better in no. 1 above). At the back of the garden the evergreens continue with bamboos, jasmine and ivy. These are all large, hardy, evergreen plants which bring year-round structure to a small shady garden. 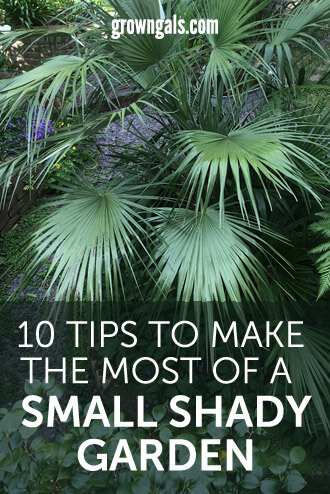 Think about the large leafed plants and trees that live under rainforest canopies and you begin to understand how shade can actually be your friend. I know some people love their lawns but they just don’t grow very well in shade. They also take up too much space, are muddy in winter and tend to push all the planting to the edges of the garden. I have dark stained decking and purple slate chippings which make the whole garden accessible even in the wet. To help soften the look I’ve allowed a carpet of self-seeded violets and californian poppies to grow through the slate. When I arrived the brick-built raised beds were already here. Raising the planting above ground level has two advantages. First I have a rich and fertile soil instead of the heavy London clay that lies beneath. Second I have several levels of planting, in tiers, to play with. Gardeners talk a lot about sequential planting. In a conventional border this means that as one plant fades another comes into flower. 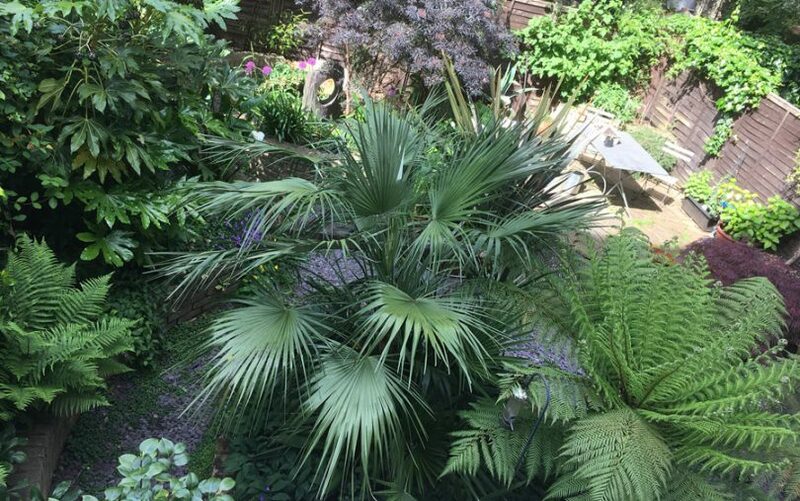 In my small shady garden where green is the main colour I’ve found that just one large clump of something fabulous is enough. The Magnolia flowers through midwinter giving way to spring bulbs and hellebores. 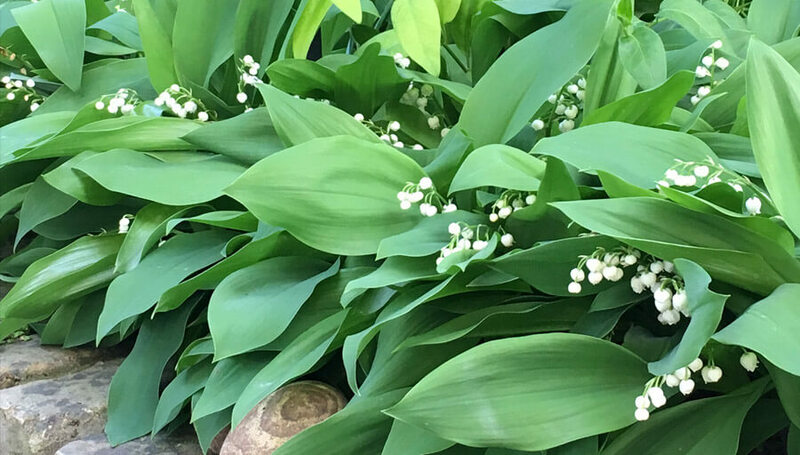 In April Lily of the Valley holds centre stage followed in May by Arum Lillies (shown above). In June the clematis begin to flower, followed by Agapanthus in high summer and Japanese Anemones in September. Finally grasses preside over autumn and a few pots of bright pink cyclamen will flower until christmas. 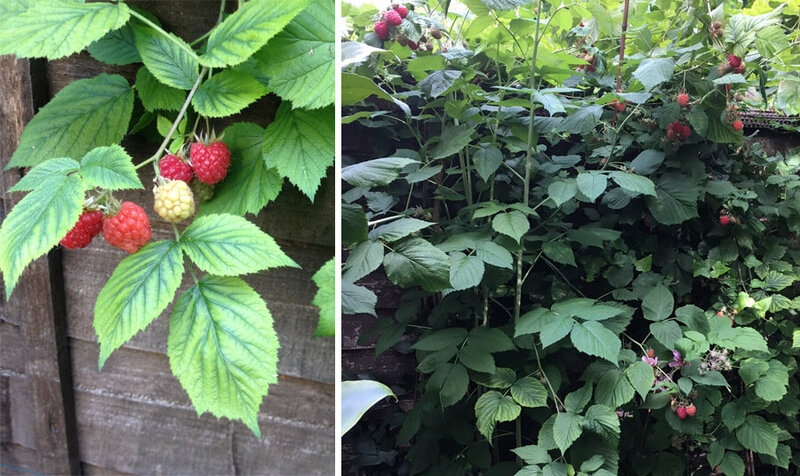 I grow raspberries and they do surprisingly well in the two sunniest spots. They are an early summer variety which is perfect because June is the best month in a small shady garden. I pick raspberries for breakfast daily but by mid July they are finished. Anything that needs the whole summer to ripen will not make it. I’ve tried tomatoes but they inevitably get blight because there’s just not enough sun in the shorter days of August. I like to fill empty spaces with objects and allow them to become weathered and overgrown. 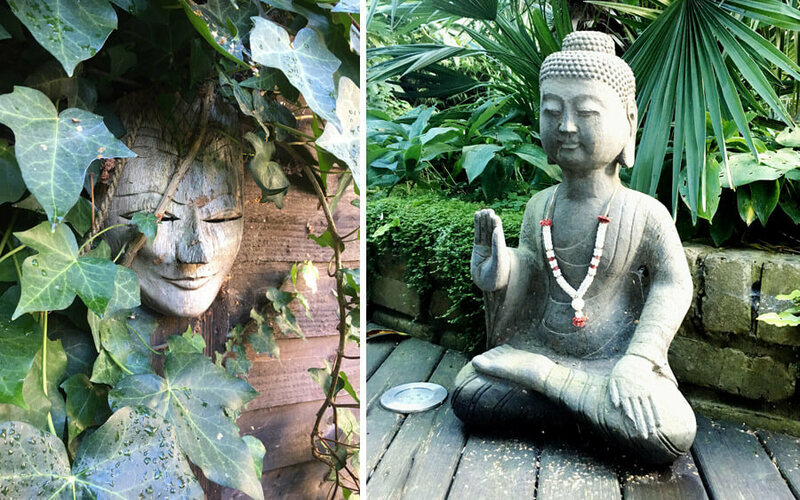 I love the way ivy has grown over a mask brought back from our travels. 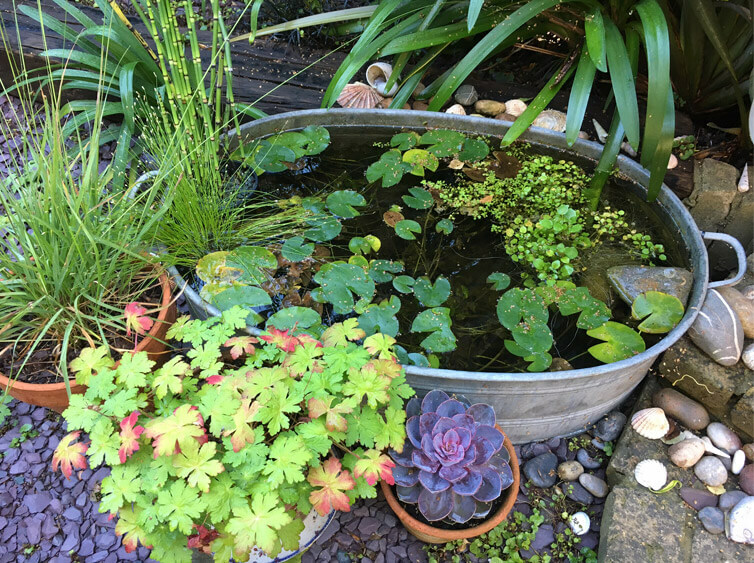 In another corner I’ve filled a cast iron tub to make a wildlife pond. There are gold letters salvaged from a local pub and rusting metal birds. The fish on the shed door was made by my other-half out of driftwood, a pebble and a rusty BBQ grill. 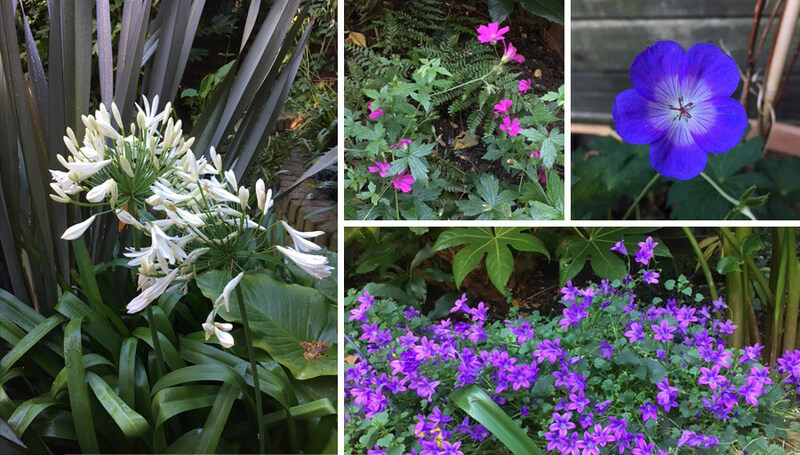 Most of the flowers in my garden are whites, purples and blues. These sit well against the many hues of green, the dark wood and the purple slate. Phormium, Black Elder (Sambucus nigra) and Huechera Plum Pudding carry the deep purple theme through in their foliage. Individual little pops of bright colour work well in dark shady corners. I’ve found that hardy geraniums tolerate shade and their stunning bright pink and blue flowers ping against all the green. Keeping to a simple palette just seems to hold everything together. 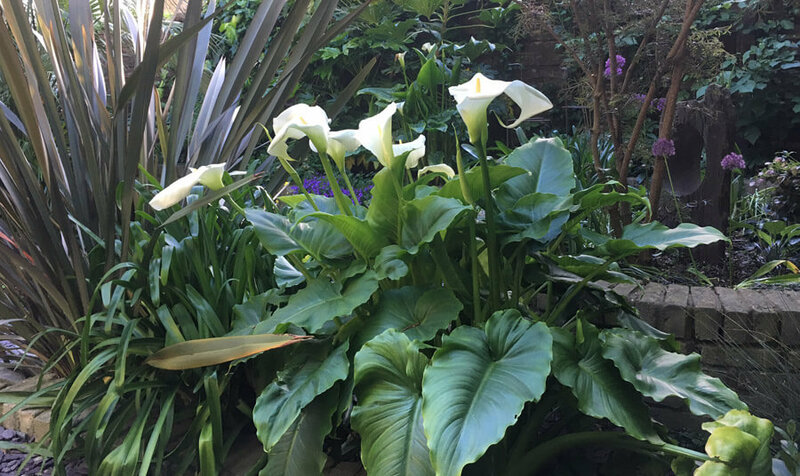 Lily of the Valley, Periwinkle and mind-your-own-business (Soleirolia soleirolii) form a thick green carpet around the tree fern and fan palm. When the Lily of the Valley die back in winter I’m reminded how sad the bare earth looks. All three plants are invasive but, when contained within the raised bed, they somehow manage to get along. I think an area of dense ground cover looks natural in a small shady garden and reminds me of how wild garlic grows in a woodland setting. I have no idea what the fern shown above is called. My mother propagated the original from a seed taken from a leaf while on holiday in the 1960s. We subsequently called it Skegness Fern and it has been spread amongst friends and family ever since. 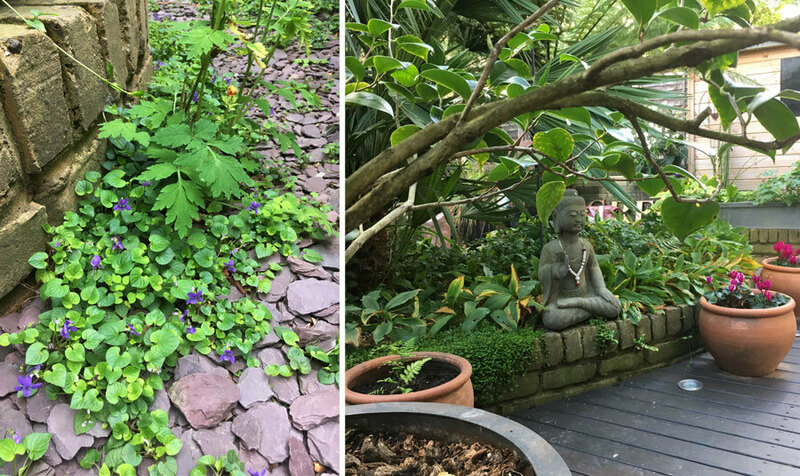 This shares the cool conditions of my small shady garden with Shuttlecock, Hart’s Tongue and Maidenhair ferns. 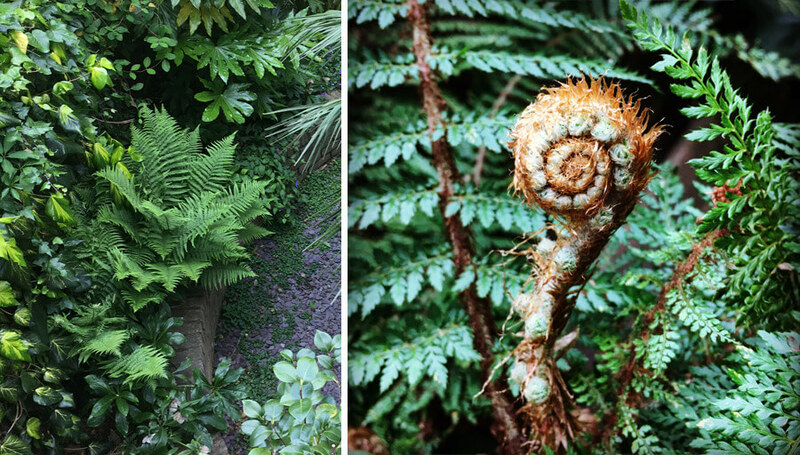 It is my tree fern (Dicksonia antartica), though, which is my centrepiece. I bought it online as a 3 foot stump and it is perfectly happy in my urban microclimate. I protect the crown with fleece in winter and give it plenty of water in the heat of the summer. I love the flexibility of container growing. Pots can easily be moved in or out of the sun to find the right spot. A tub of spring tulips can be moved centre stage and then shoved to the back to die down. 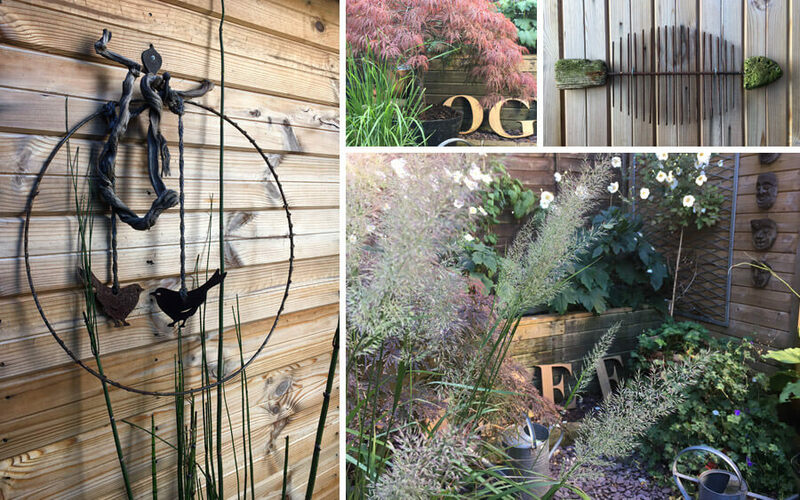 Groups of plants can be placed in infinite combinations to create the perfect scheme. It’s not all plain sailing though – pots dry out quickly so require regular watering and feed. They are also susceptible to vine weevil. Long before I moved in my garden was a woodyard and much of it is still concrete below the slate. In order to get plants into every corner I bought large plastic cold water tanks to use as huge containers. It’s much cheaper than buying large pots and they are easily disguised with a bit of vertical decking. This post was inspired by a slide presentation I gave at my local Hackney gardening club, De Beauvoir Gardeners. Several members spoke informally about planting and planning their gardens. If you are green fingered you might also enjoy reading about my foray into growing food: my first allotment and tips from my secret garden.